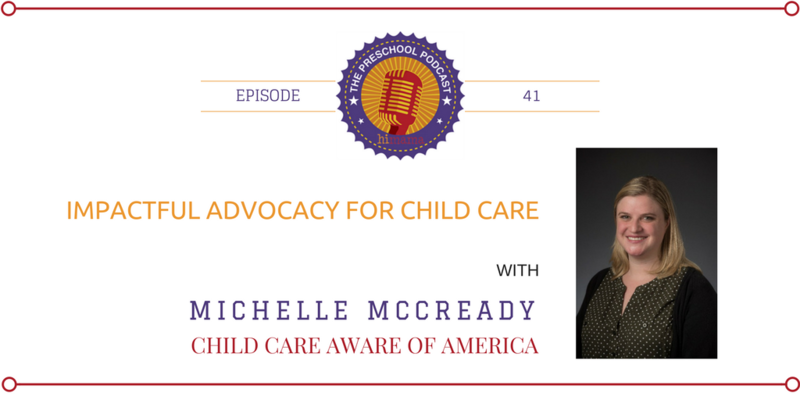 INTRO: On episode 41 of the show we talk about impactful advocacy with Michelle McCready, Chief of Policy at Child Care Aware of America [CCAoA]. Michelle provides vision, leadership, and management to the policy and evaluation division at CACoA. In our conversation we talk about the history of childcare in America; the influence of child care on the American economy; the present state of childcare under the Trump administration; and the importance of advocacy from childcare practitioners to provide vital insight for policy change. Michelle emphasizes that it is crucial for educators to speak up and become the voice for better outcomes for children. If you are someone who cares about the future of childcare and want actionable steps and how you can contribute to the conversation, then stay tuned for this episode of the Preschool Podcast. Ron SPREEUWENBERG: Good morning, Michelle. Thank you for joining us on the Preschool Podcast today. It's great to have you on the show. Michelle MCCREADY: It's great to be here. Thank you so much. SPREEUWENBERG: So let's get started with just getting a bit of a background on your role at Child Care Aware of America. MCCREADY: Absolutely. I’m the Chief of Public Policy a Child Care Aware of America. And Child Care Aware of America is a national, nonprofit membership organization where we support working families across the country to find and afford quality childcare. SPREEUWENBERG: So as Chief of Policy, what does that mean? MCCREADY: Sure. So I actually oversee and manage several different departments, programs and initiatives. I oversee advocacy and public policy. So we work on federal initiatives with members of Congress and the Hill, to show them and share with them research and education on why quality childcare is important and make the case for it. I also work on several state projects with our membership organizations across the country. We have 450 different childcare resource and referral agencies throughout all 50 states. And what they do is, they support providers and parents to find and afford quality childcare. And so we work with them on several different policy fights at the state and local level. And also I manage our research department, where we have signature research reports – like “Parents and the High Cost of Childcare”, for example – that looks at the costs of childcare in every single state and compared that to other household expenses. And no surprise there it's one of the highest household items for parents and families, unfortunately. And I oversee our advocacy wing and department. And we've recently launched a movement called ChildcareWorks.org, where parents and families and teachers can comment and share their voice and leverage their voice to policymakers to talk about the different challenges that they're experiencing with the childcare landscape. SPREEUWENBERG: Very cool. OK, so, lots of stuff going on. Let's start with the policy piece. So you're talking to the folks over there in Washington, D.C. What's the word on the ground in terms of the current state of early-childhood education policy in America? I think a lot of us can speculate and have theories but it'd be interesting to hear from someone like yourself who's very close to this subject. MCCREADY: Absolutely. So before we dive into the current happening I wanted to just walk back a little bit about the complex history with childcare in America, and that the economy actually for a long time has depended on women to work. And right now there's almost 70% of women with children under 18 that work outside of the home and support the economy. So actually in the 1940s, during World War 2, Congress passed the Defense, Housing and Communities Facility Act because of the war and because of the need for women to work there was subsidized childcare available for the first time in U.S. history, where parents didn't even pay a high co-pay. It was just available to them six days a week. That actually happened, or almost happened, again in the 1970s in America when Congress passed the Bipartisan Child Development Act Fund. And it was passed, again, bipartisan – both Democrats and Republicans agreed that this was an issue that working families needed. And unfortunately it was actually vetoed by Nixon. There was some worry about it undermining traditional family values and the family structure. So that it's been 45-plus years in something like both of those initiatives – comprehensive childcare and universal childcare – was brought up in a serious way. However, more recently, there have been several programs and proposals that have been put on the table that don't necessarily get out a universal early-childhood funding system, but that do tackle pieces and parts of the challenge. President Obama, most notably in 2013, proposed a 10-year, $75 billion investment for universal pre-kindergarten for all four-year-olds. There's been some initiatives around increasing Head Start and Early Head Start childcare partnerships. There was the reauthorization of the Childcare and Development Block Grant of 2014, which put in parameters for health and safety and quality increases to childcare. But, again, nothing significant as far as universal program support. And now what we're faced with is, although that the Trump administration has mentioned childcare, there is a proposal out that does a lot with tax credits. We haven't seen anything significant that would really support working families in the way that they need it. In fact the budget that was just proposed on March 16th would cut key services in the Department of Health and Human Services, which funds the Childcare Development Block Grant and other initiatives. And it actually did cut significantly after-school childcare programs that many parents rely on. So it’s very bleak picture right now in what's happening on the Hill and in government around, not increases to access for quality childcare, but a lot of cuts that could be detrimental, in fact, to parents and families. SPREEUWENBERG: So the trend isn't really great right now. There's been some sort of historical moments of possibility in terms of providing more universal and accessible childcare to everyone across the country. But right now we're in a place where it sounds like we need to be having this conversation and getting the word out about the importance of early-childhood education, both at the state and federal level. Now if I'm an early-childhood educator and I'm going into work with children in the classroom every day, what does this mean to me? MCCREADY: Absolutely. So I would say teachers and educators in the early-childhood space, their voice is more important now more so than ever. So we expect skilled teachers to lay the foundation for children’s learning and development and success. Yet the workforce are paid a median wage of $10 per hour, and sometimes less. And many are living in poverty themselves and rely on assistance. So what we know is that the childcare workforce overall is underpaid and under supported, and that we depend on them. that they're the teachers with the children all day, and that brain development in those first five years of life are so critical, and that these teachers are really committing their professional lives to help set the stage for children's academic and lifelong success. And so what they can do – and what teachers in the early-childhood education space should be thinking about – is that they are the most equipped, actually, to raise their voice for advocacy around the workforce. For one thing, they see the difficulties they're facing in their role firsthand. They can paint the picture back to policymakers about how important their job is, and make the case on why funding and investments and training and all those things and resources that they depend on is so important. They can also paint the picture for policymakers about how important their role is to parents, to keep the economy thriving and how much parents rely on quality childcare so that they can work. SPREEUWENBERG: Now if I'm an educator – I get up early every morning, I get to work and then I'm working with 10 to 20 preschool children all day, and by the end of the day I get home and, you know what, I'm just really tired, I have basically no energy left to do anything – how am I going to find the time and energy to do this? MCCREADY: That's a great question. And we especially, as folks that know how important advocacy is, we also recognize that teacher's role is fulltime – beyond full time. It’s a constant. They’re on their feet; they're working really hard. And so there are ways and tricks to do advocacy and make it impactful but not have to do a huge left around it. I wanted to talk a little bit about what some of those ways are. And we need them. That's the other part – we need the early-childhood workforce to carry the torch for those in society as they're working so hard. So I want to talk to some of the tips that you can do. Even if you feel like you can't fit anything else in, hopefully some of these ways will help support you to do your current work as a teacher but also let your voice be heard as an advocate. So during some of the weekends, or any time that you have free time, what's wonderful is to build relationships with policymakers. So you can schedule an in-person meeting with them or get a group to go once – it doesn't have to be all the time, maybe once every six months – and talk with them about what you're seeing and how important your program is. Have a coffee with them; have a lunch with them. So I know that that's hard to do, to step out of teaching. But sometimes they can meet you where you're at. Another thing is, if you can invite them to visit your early-childhood education program – and this is just such an impactful way to share with them and show how important the work you're doing is to the communities that you serve – they can see the children learning and growing, and the teachers, the job that it takes every single day to do interaction and to love those children and teach them and help support all of their developmental needs. Another thing that teachers can do, and that doesn't take too much of a left, is media involvement and presence. So even a letter – writing a letter to your local newspaper about, “My role as a teacher means to me…” Constantly, op-ed pieces are being published and letting that voice be known in that local paper, especially if they have a hobby of writing or social media. This is a great tool to use that voice towards something that can really impact and affect change. Another great test that we've seen be really successful is building a network, and using some of these social media platforms to do that. So are you connected with other early-childhood teachers, or professional organizations in your community, or community-based organizations that can do a lot of this work for you, and want to, and want to find advocates that are involved? And I'll talk a little bit about how to find those networks. But that network that you connect into, or that you build from the ground yourself, can serve as a great vehicle for networking, for strength in numbers. When there is a policy or proposal that comes down you’ll have this kind of team of rapid responders ready to talk about that policy issue. Another great thing about that network is to constantly keep updated on recent information. So joining things like Google Alerts and typing in “early-education”, or “pre-K”, or “childcare” in those free alerts can keep you up to speed on the latest news. So you can be really plugged in to what's happening on the policy landscape. SPREEUWENBERG: Very cool. Two things I wanted to touch on that you've been talking about here, and the first one is something that you mentioned which I thought was very interesting about what you can do as an educator and sort of how to approach the problem and how you're best equipped. And one of the things that you said is, you can stress the importance to parents and how important it is for working parents to be able to go to work and have the income that they need to support their children and to support the economy. And what I found interesting about that is that, really, as an educator, you can take you know the viewpoint of what's important to those people that you're advocating to and not necessarily sort of talking about everything that's important and necessary for you, but you're positioning in a different viewpoint which may help to get to the end game that you're looking for, which is more support for early-childhood education but positioning it in a way of, like, “Look, what we do is so important to the economy and the success of America as a whole.” And I think that's just a really interesting kind of take that's a bit unique in the first time I've kind of heard that. MCCREADY: That's exactly right. That's such a great argument, and such a great justification about why the early-childhood workforce is so critical. Of course it's critical in the professional experience of that personal professional. And of course it's important for that child. But it is really an economic engine for our communities. Parents can't work without childcare, right? We know so many policymakers talk about the need for business, the case for business, the case to grow the economy. A big part of that foundation is the childcare workforce. SPREEUWENBERG: Yeah. And for better or for worse, if that is what is going to drive change and investment in early-childhood education then that's a great message. And especially in the context of when you tell us about the history of what has happened in terms of policy, the first time we had the idea of subsidized childcare was in the 40s, when it was introduced to encourage women to go to work. Right? SPREEUWENBERG: So that's a very interesting point there that I think our listeners should mull over a little bit. The other thing that I wanted to touch on that I think is also very powerful is the point you made about networking and social media and being very involved. And I think that speaks to the power of the change you can make which is more powerful as a group, as opposed to just a single individual. But when you get all together and everyone is behind it, I think that's very powerful. So any further thoughts about you know where people can go or what people can do to get more involved in these networks? MCCREADY: Absolutely. So we have Child Care Aware of America connections with several hundreds of different childcare resource and referral agencies and other professional organizations that care deeply about this issue. They care about supporting the workforce. And they also engage parents to find and afford quality childcare. A lot of them are also doing advocacy already. And so they're looking for advocates; they're looking for teachers and childcare professionals to join their network and really ensure that they can make their voice heard. You can actually find our network by ChildCareAware.org, and you can also visit us at ChildCareWorks.org. And you can take direct action and advocacy. You can get involved, join our movement. We'll show you how to write letters to Congress. We'll show you how to talk to the media and leverage your social media platforms to make your voice heard and more powerful in larger numbers. SPREEUWENBERG: Awesome. So there you have it: if it's not you leading the change, then who's going to do it? I think that's really great advice. Michelle, thank you so much for coming on the show today. Some great words of wisdom for early-childhood educators out there. And let's make this change happen, guys. Thanks Michelle. MCCREADY: Thanks so much, Ron. Take care.